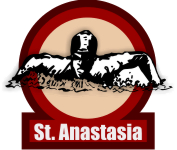 Competitive Swim Team for boys and girls up to age 14. There is no minimum age requirement for participation. Any boy or girl up to and including the age of 14 who lives within the parish boundaries, qualifies for a residency exception, or attends The Divine Wisdom Academy (formerly St. Anastasia School) is eligible to try-out. While we do work on improving stroke techniques, this is not swimming lessons. Children must be able to swim 25 yards (1 lap of the pool) to join. Swimming test will be given the first day of practice for all new swimmers. Saturday mornings at Immaculate Conception Center in Douglaston from 8:00 AM to 9:15 AM from September through April. Friday evenings at Bayside High School, Richmond Hill High School or Fort Hamilton High School at either 7:00 PM, 8:00 PM or 9:00 PM. Times vary from week to week. Boys’ swim meets are held from November through January and girls’ swim meets are held from January through April. There are also additional meets at the end of each season for Olympics and Championships on the weekends. The times and locations for these meets vary.